The Peoples Democratic Party has said President Muhammadu Buhari is too weak to lead the country. 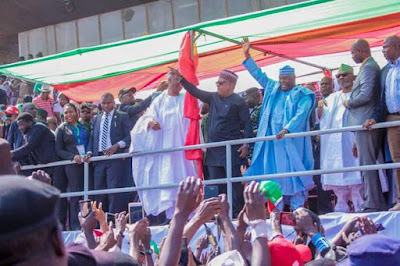 The PDP National Chairman, Uche Secondus, stated this during a presidential rally of the party at the Ahmadu Bello Stadium, Kaduna on Thursday. The PDP chairman stated that Buhari had tried his best and should go home and rest. Secondus said, “Now is the time for you to take a stand and firmly too, to know that it is time for us to ask President Buhari to go home. Let him go home. Baba has tried. Let him go home. The energy is no longer there. And we know that by the grace of God, we need somebody with a lot of energy. We need somebody who will work for 24 hours. “We don’t need Buhari to give this government to a cabal. If you vote for the APC, the cabal will still be in control. There will be hunger in the land. The man is weak. President Buhari is weak. He cannot rule. We advise him to go home. “They have been sleeping on duty, that is why we have security problem in the country. They have been sleeping; that is why we have hunger in the land. Now, it is time for us to ask President Buhari to go home. Let him go home, he has tried. Secondus warned against rigging the forthcoming general elections. Speaking, Atiku said with him on board as the President, he would not only tackle insecurity in the land, he would also return the country to the path of progress. Earlier in his remarks, the Director General of the Atiku Abubakar Campaign Organisation and Senate President, Dr Bukola Saraki, said the APC was running out of lies as the ruling party had not fulfilled any of its campaign promises to the people. He said, “Today in Nigeria and the entire North, there is no security. No jobs. Many years and months of lies, the truth must come out. Nigerians are seeing the truth now.